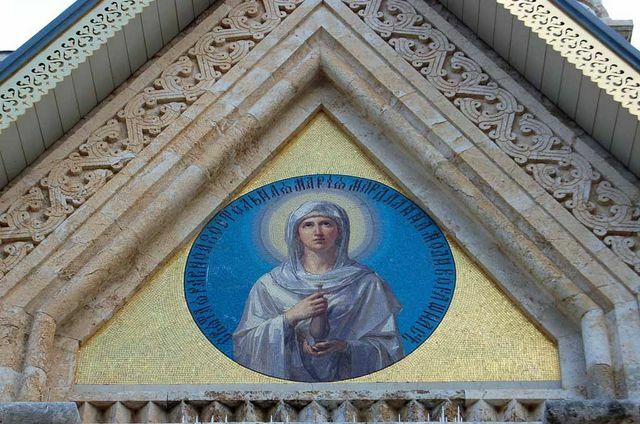 After the completion of important works on the interior decoration of the Gethsemane Church, on June 10, 1888, Father Antonin makes an important proposal to perpetuate the memory of the Empress Maria Alexandrovna: "1. To assign the name of the Assumption, Mariinsky, Gethsemane ... to the Russian Church of St. Mary Magdalene in Jerusalem ... 6. To keep the High Owners of the place on it their own flag, which would cover themselves in the full inviolability and inviolability of Their property. 7. To form under the Gethsemane Church a Museum - from objects that had some closeness and touch to the blessed memory of the Grand Duchess Maria Alexandrovna, such as: icons, paintings, Her own portraits of different eras, books, table things, etc. 8., Arrange around the Church of St. Mary Magdalene and throughout the whole space of our Gethsemane territory, the garden, in its capacity, and in our northern and tropical plants, the most favored by the climate grapes of the best varieties, whose fruits - in some form or another would be forwarded to the imperial court - a blessing from the Holy Mother of God. 9. The Days of May 22 and July 27 to make for all time the days of memory and funeral service and alms giving to the poor and miserable Jerusalem without distinction of their nationality and religious characteristics, and on July 22 - on the Church's feast day - to honor it with a solemn Patriarchal divine service, - with by the example of the festive days of the Holy Apostle James, the brother of the Lord, and of St. Constantine and Helen, to the Christian population of Jerusalem, after the mass, bread and wine.  " the Countess OE Putyatina, Mission and Russian consulate. Not all of Antonin's ideas were subsequently realized, however, a garden with clusters of vineyards can still be seen in the Gethsemane Abode, and at the entrance to the temple there are memorable tables of marble in 4 languages - Russian, Arabic, Greek and Latin : "In memory of the deceased Empress Maria Alexandrovna in the Lord." «№1. The stone, known as Meleki, i.e. Tsarist. White limestone with grayish, and sometimes yellowish veins. The stone of this homogeneous grain, perfectly removes a cut for decorations, is not influenced by climatic conditions and is preferred in the Holy Land for exterior decoration of all significant structures. It is used in the construction of: the church of the Resurrection of the Lord, the Bethlehem basilica, the facade of the French hospital of St. Louis (1882), the facade of the Greek monastery of St. Abraham (1884) and the new patriarchal bazaar (1886). This stone is faced with all the outer walls of the church of St. Mary Magdalene, with the exception of the lower part of the floor to the ground. №2. Miji Abiad 1. White homogeneous strong limestone, he is considered the best of the hard stones of the Holy Land, but it is more difficult than the first to undergo a cut. It is very good for the lower parts of the structures and is used for the entire exterior decoration of the Trinity Cathedral on Russian buildings, on the basement floor of the Greek monastery of St. Abraham (1883) and the Bethlehem bell tower (1886). They are facing the outer walls of the lower part of the church of St. Mary Magdalene from floor to earth, as well as he went to the steps of the stairs, railings and socle. No. 3 Migi Abiad 2, rough processing, used to lay internal walls and pillars of those who are supposed to maintain great heaviness in the church of St. Mary Magdalene. №4. Kakuli. Soft limestone; very much used in buildings in the Holy Land because of its beauty and lightness of the lining. 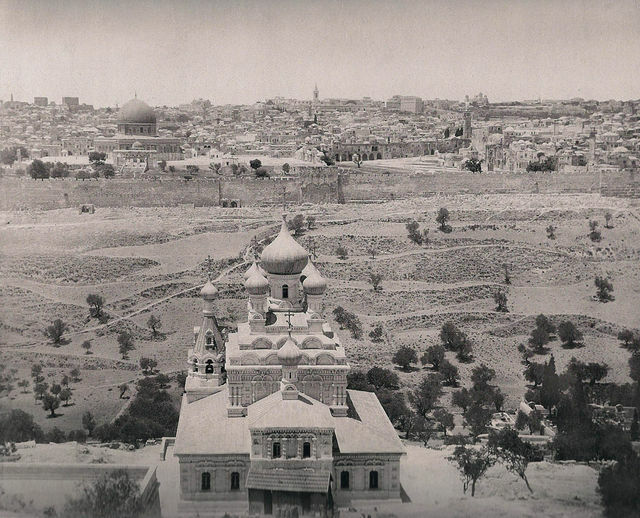 Despite his vomiting, which affects the absorption of dampness, he is used in significant Jerusalem buildings, such as: on Russian buildings (consular house, hospital, shelters) and on the Russian church and bell tower on the Mount of Olives. In the church of St. Mary Magdalene, he went to the lining of internal walls that do not support a significant weight. №5. The plates of Essini. The strongest stone of the Holy Land, which can be polished. Its color varies from gray to yellow, with reddish veins. It is used on the platform of the whole church. №6. Plates of Migi Abiad. The same quality as stone number 2, rough finish, it is used on the cistern platform ". Church of St. Mary Magdalene, made of different varieties of Jerusalem stone. 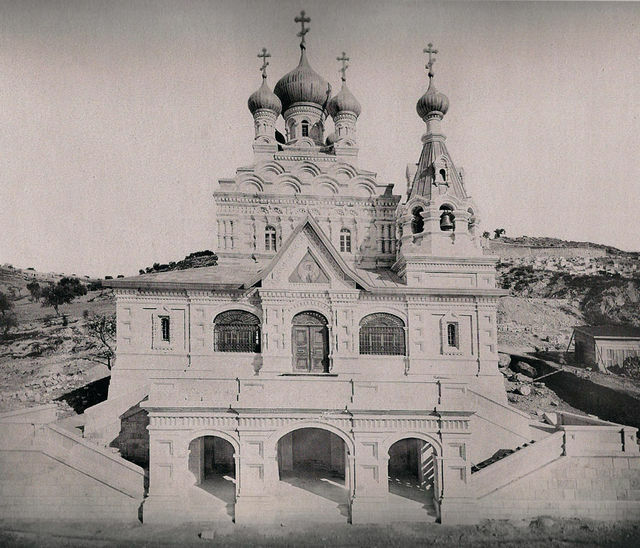 From the report of the Secretary of the Orthodox Palestine Society (OPS), Mikhail Petrovich Stepanov, to the President of the Society, Grand Duke Sergius Aleksandrovich, dated August 6, 1888, that when the church of St. Mary Magdalene with all the interior decoration was spent 200.233 rubles 12 kopecks , which greatly exceeded the original budget of G.Frangia, however, it was almost twice less than the estimate presented by the Jerusalem architect K.Shik. "His Imperial Majesty the Grand Duke Paul Alexandrovich received from the Imperial Majesty the Emperor 135,000 rubles, From Their Imperial Highnesses Grand Dukes: Vladimir Alexandrovich 15,000 rubles, Alexei Alexandrovich 15,000 rubles, Sergius Alexandrovich 15,000 rubles, Pavel Alexandrovich 15,000 rubles and the Grand Duchess Maria Alexandrovna, the Duchess of Edinburgh 5000 rubles, from the valet Khrenova 129 rubles, from Princess Shakhovskaya 100 rubles, from the staff captain Sergei Danilovich Nikolayev 100 rubles, about Peasant Ogarkova 4 rubles. " Thus, the main dominant among the donors we see members of the Imperial family, who were all Honorary members of the Orthodox Palestine Society. It is interesting that the future chairperson of the Imperial Orthodox Palestine Society, Grand Duchess Elizabeth Feodorovna, sacrificed personally embroidered carpet for the temple to the altar of the church of St. Mary Magdalene, 28 court ladies donated a carpet from the middle of the church to the Throne, A.N. Maltsev silver device for the service of requiems, Gr.SK. Perovskaya and Gr. A.A. Tolstaya donated air, D.F. Tyutchev's mosaic icon, E.A. Schneider - carpet for the place reserved for the Highest Persons, Gr.O.B. Perovskaya, Gr. V.B. Perovskaya, A.P. Ozerov, M.P. Ozerov, M.P. Stepanov donated 12 icons of twelve holidays, AA. Vasilchikov - air, unknown peasant woman - gospel to the throne, peasant Ogarkov silk handkerchief and piece of cloth . 3. Yakov Halebi, dragoman of the head of the Russian Ecclesiastical Mission since 1863 about whom Smyshlyaev gives the following response: Yakov Halebi sincerely devoted to Russia and the interests of the Orthodox Palestine Society; he is the only person whose advice and assistance I use without any fear of being deceived ". 4. Mikhail Ivanovich Osipov - the authorized Palestinian Society in Odessa, because "all the premises for the church, without exception, were taken by Osipov himself on the railway and under his personal supervision were transported and loaded onto a steamer ... All pilgrims departing from Odessa to Palestine use it services and kind assistance, and speak of it only as with a feeling of gratitude and full respect ". The solemn consecration of the church of St. Mary Magdalene in Gethsemane was timed to coincide with the time of the journey to the Holy Land of the Grand Dukes of Sergei and Pavel Alexandrovich and Grand Duchess Elizabeth Feodorovna from September 29 to October 6, 1888. The description of their journey was published in the Government Gazette in St. Petersburg on October 27, 1888: "The Grand Dukes and Grand Duchess, except for Constantinople, visited, to Jerusalem, Smyrna, the ruins of Ephesus, Beirut, the ruins of Balbek, Damascus, Kaifu, Nazareth , Cana of Galilee and Tabor, and everywhere He was provided not only officially-solemn, but quite enthusiastic reception ... On September 30, at 4 pm, Their Highnesses went to the newly built St. St. Mary Magdalene, near Gethsemane. In the doorway of the temple, the Patriarch, dressed in a robe, epitrachel and omophorion, met the Grand Dukes and the Grand Duchess with a cross and St. water, and brought them into the church for the place prepared for Their Highnesses on the left choir. After reading the Beatitude of Nicodemus, the prayers of Patriarch Callistus were kneeling, His Beatitude entered the altar and, blessing and preparing according to the order of St. relics, put them on the analo before the local icon of the Savior. Then the All-Night Vigil began, which was served by one of the hieromonks of our Spiritual Mission. 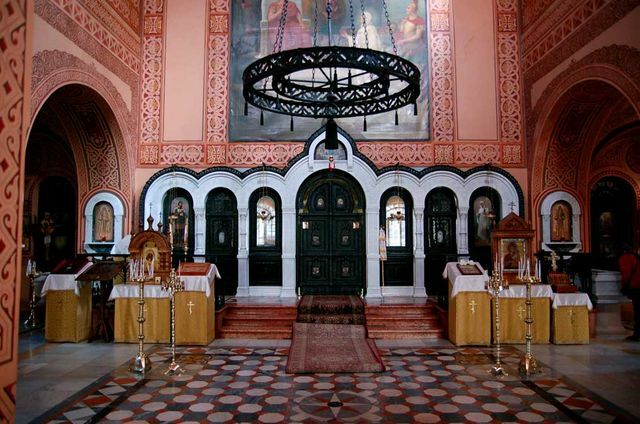 The next day, October 1, Their Imperial Highnesses were pleased to arrive at the Church of Equal-to-the-Apostles Mary Magdalene by 7½ o'clock in the morning. The Grand Dukes and Their retinue were in full dress. On the route of Their Highnesses, from the house of the Russian consulate to the church, there were Turkish soldiers; the horse convoy followed the crew of the Grand Dukes and the Grand Duchess, and at the gates of the church fence stood an honor guard with music, which, as the Highness approached, played the Russian anthem. Upon the exit of their crew, at the gate, Their Highnesses headed for the church, when the bells of the newly built church and the Russian Church of the Ascension, built by Fr. 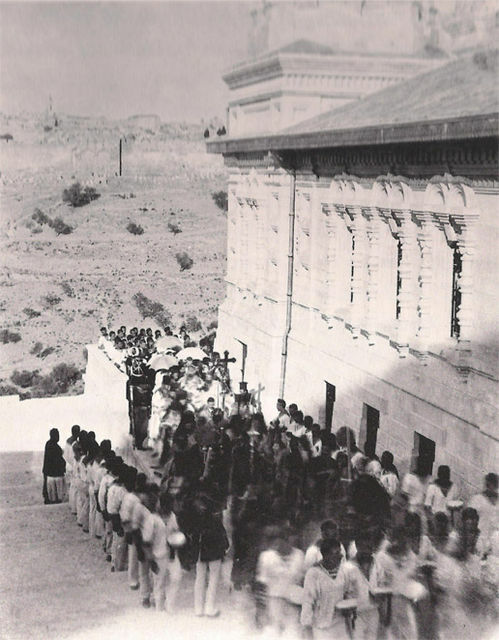 Archimandrite Antonin on the summit of the Mount of Olives; On the site, against the temple, sailors were built, among 90 people, from the clipper "Zabiyaka" and the cruiser "Kostroma", with officers on the right flank. On the same site, the guests were gathered: the governor of Jerusalem, Reuf Pasha, the commandant of Jerusalem, the Greek consul, the Russian consulate and over 150 Russian pilgrims. The Grand Duke Sergius Alexandrovich greeted the command, went around its front, and then Their Highnesses ascended the stairs to the church, in the doorway of which they were greeted by His Beatitude Nicodemus with two bishops and our Spiritual Mission in vestments. When Their Highnesses entered the church, the Patriarch picked up St. Paul from the analogue. relics, after which the procession began around the outer walls of the temple. Grand Dukes and Grand Duchess, and behind them, and all those present followed the procession. The procession of 10 sailors was opened and closed, and the other sailors walked along the sides of the clergy with trellis. Before the entrance gates of the temple, which were closed immediately after the exit from the church of the procession, the Patriarch read the established Gospel. After the third round, the gates were dissolved, and the clergy, and after him and Their Highnesses entered the temple. The consecration began according to the order, according to the Orthodox charter, and the patriarch read the prayers in Slavonic. While His Beatitude prepared the ark with St. relics, St. miro, antimins and all other items necessary for sanctification, Their Highnesses were in the altar. At the position of St.. relics into the ark, the Patriarch three times proclaimed the eternal memory of the Empress Maria Alexandrovna; the choir sang eternal memory and all present sat down on their knees. The minute was solemn and you are extremely touching. At the end of the consecration, the divine liturgy was celebrated, which was performed by His Beatitude Nicodemus with the other above mentioned clergy. Blessed is God who fulfilled your desire, prompting you to take such a long journey. We cordially welcome this undertaking and the business that you have already accomplished. This temple, erected by you, near the Church of the Holy Sepulcher, in the eternal memory of Your Most Pious Mother, will at the same time be an eternal monument of love and reverence for the Mother of the Church that gave birth to all of you. The good heart of His Imperial Majesty the All-Russian Sovereign and the zeal of your Imperial Highnesses and other porphyritic Your Brothers erected an immortal monument in holy places in the person of this temple, in which henceforth hot prayers will be spoken about the Most Pious Emperor and Empress Empress, about the Sovereign Tsesarevich and about the whole of the reigning house. The funeral prayers will be pronounced for the ever-memorable Empress in this temple dedicated to the name Her Saints. Mary Magdalene. Gratitude to the parents is always visible from their deeds, and your work is a matter of gratitude to the Boz of the deceased Mother and, at the same time, there is a monument of piety, acceptable to God, for God is glorified in his saints and in His divine abodes. May the Lord God grant, with the prayers of the Holy Equal-to-the-Apostles Mary Magdalene, unharmed health, peace, glory and victory over enemies to His Imperial Majesty the All-Russian Alexander Alexandrovich, Her Imperial Majesty Empress Maria Empress and Blessed Tsarevich Tsesarevich and Grand Duke Nikolai Alexandrovich and the whole Reigning House; You, who accepted the fulfillment of the Tsar's desire, grant the Lord a heartfelt joy, and fulfill the desire of your hearts, To Her Imperial Highness the Blessed State and Grand Duchess Elizabeth Feodorovna, may the Lord God give a peaceful, lasting and joyful life. May the Lord God bless you from Zion and see the good Jerusalem in all the days of your belly. Amen." Upon the departure of the Grand Dukes and Grand Duchess from the church in the churchyard was invited from Their Highness treat all Russian pilgrims and sailors. On the same day, in the evening, a dinner was held at Their Highnesses, attended by the Patriarch with two bishops who served him at the consecration of the temple, the head of the Russian Ecclesiastical Mission, Archimandrite Antonin, the actual State Councilor M.K. Onu, an adviser to the Russian embassy in Constantinople, who was sent to Jerusalem for the time of their Highnesses' residence there over Syria and Palestine; local authorities; Countess O.E. Putyatina, who heads all the women's institutions of the Palestinian Society in the Holy Land; D.D. Smyshlyaev; the Russian consulate; officers "Zabiyaka" and "Kostroma"; the architect of France, the builder of the newly-consecrated church, and other persons. On the eve, Grand Duke Sergiy Alexandrovich presented to the many individuals who participated both in the construction of the church and in the activities of the Palestine Society in the Holy Land the Highest Orders awarded. Including the Patriarch received the diamond insignia of the Order of St. the faithful Grand Duke Alexander Nevsky; Archimandrite Antonin - St. Prince Vladimir Equal-to-the-Apostles 2 nd degree; Governor of Jerusalem Reuf Pasha - Anna 1st degree; The same order was received by our Consul General in Beirut, K.D. Petkovic, who provides continuous assistance to the activities of the Palestinian Society in Syria; D.D. Smyshlyaev - St. Prince Vladimir Equal-to-the-Apostles 3rd degree; architect of France - St. Anna of the 2nd degree and so on ". "The church, about the five domes, is built in strict Russian style, according to the project of the secret counselor of Grimm. He stands on the terrace, on which the entrance is on two divergent staircases; The church is built of white local stone; from it, all the exquisite ornaments, in the form of columns on the sides of windows, and all sorts of elegant patterns are carved remarkably artfully. Above the altar stands a small dome, and the bell tower stands over the south-west corner of the church. Above the entrance western gate flaunts a large mosaic image of St. Equal-to-the-Apostles Mary Magdalene, beautifully executed in Venice, in the workshop of Salviati, according to the sketch of Professor Vasiliev. The roof is zinc, and all the impression produced by the appearance of the church is white, joyful, luminous. We must give justice to the architect-architect of France, who, despite all the difficulties, managed to fulfill the project sent to him in such perfection. 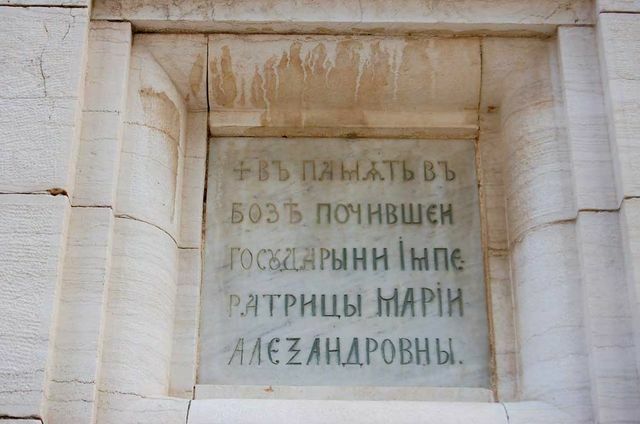 From the side of the facade, on the poles on which the western part of the terrace is kept, between the stairs, is carved on marble slabs, in four languages: Russian, Greek, Latin and Arabic, the inscription: "In memory of God the deceased Empress Maria Alexandrovna." Construction of the church of Sts. Mary Magdalene. 1888. The interior of the church consists of a vestibule connected by arches to the middle part. The walls are decorated with elegant ornaments in two warm, reddish-brown tones. 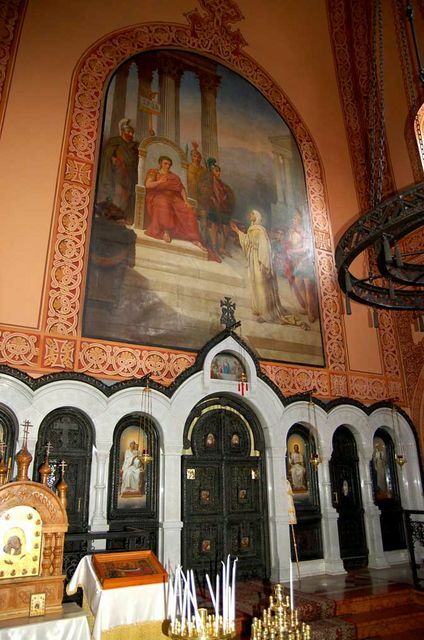 Above the iconostasis, consisting of dark bronze openwork parts, interconnected by light Byzantine marble columns and the same arcuate cornices, as well as on the opposite wall and on the side walls - large images of the life of St. Mary Magdalene; beautiful painting of the iconostasis belongs to the brush of Professor Vereshchagin (local icons and royal doors) and Professor Vasiliev (The Last Supper). image of St. Mary Magdalene in the emperor Tiberius. The church and saltworks are marble, mosaic. Chandelier, made of wrought iron. The throne, in the form of a meal, consists of an ancient marble column found near the site of the Ascension of the Lord. The whole impression of the interior of the church is integral, cozy, conducive to prayer. 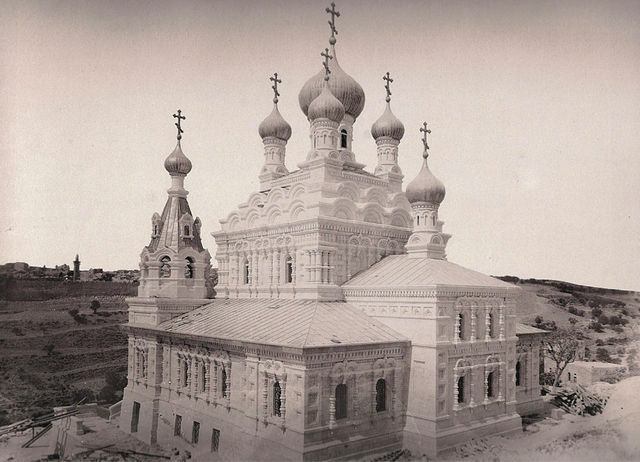 It can be safely said that this temple, according to the grace, richness of interior decoration, church utensils (the work of Ovchinnikov and Khlebnikov, according to the drawings of Mr. Grimm) and vestments (Zheverzheyev), will serve as a precious and quite worthy One, Who so dear was Orthodoxy and Which so cordially took care of the Orthodox and the Holy Land. In place, position better than that occupied by the church, it would be difficult to choose: the church stands at the foot of the Mount of Olives, touching the "place of prayer for the cup", near the Tomb of Our Lady, just opposite the Golden Gate of St. Grad, which flaunts on the opposite side The Josaphat Valley; through these gates, as is known the Savior drove to Jerusalem on a donkey. From now on, the holy mountain of Eleon is adorned with two Russian churches: one stands at the foot, the other at the top of the mountain ". 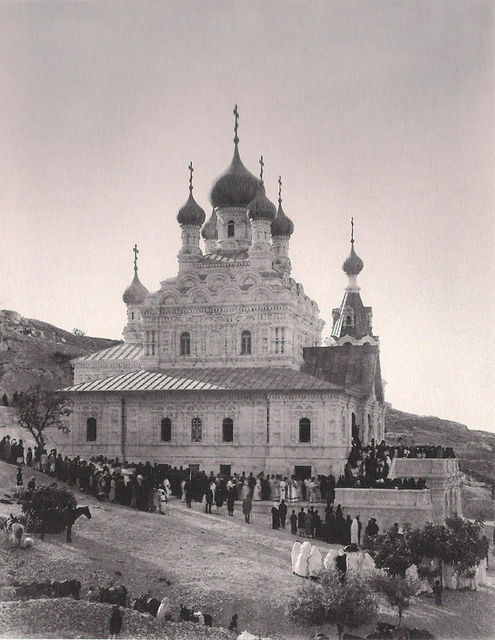 As noted above, the future Chairperson of the Imperial Orthodox Palestine Society, Grand Duchess Elizabeth Feodorovna presented the new Jerusalem Russian church in Gethsemane with holy vessels, the gospel and air. In May 1982, these liturgical objects were used in the performance of the Divine Liturgy by the Russian Orthodox Church Outside of Russia on the day of the transfer of the relics of the Grand Duchess Elizabeth Feodorovna and the nun Varvara . Deep impressions of spiritual experiences in the Holy Land will remain forever in her prayerful memory. Returning to Russia, Elizabeth Feodorovna empathizes with everything seen in the Holy Land in her heart. 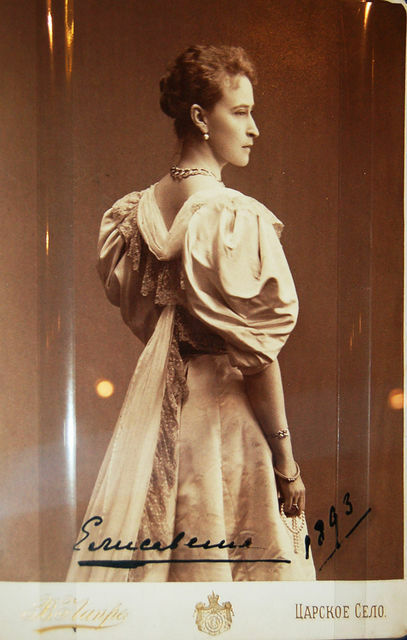 Gradually, learning about Russian life and its Orthodox traditions, Grand Duchess Elizabeth Feodorovna consciously accepts Orthodoxy in 1891, despite the disapproval of even her own father. This step brings it even closer to a genuine historical Russia with a deep tradition of Orthodox faith. The greater part of the Romanov family, including her grandmother - the English Queen Victoria, with great joy, accepted the news about Elizabeth Feodorovna's transition to the Orthodox faith . 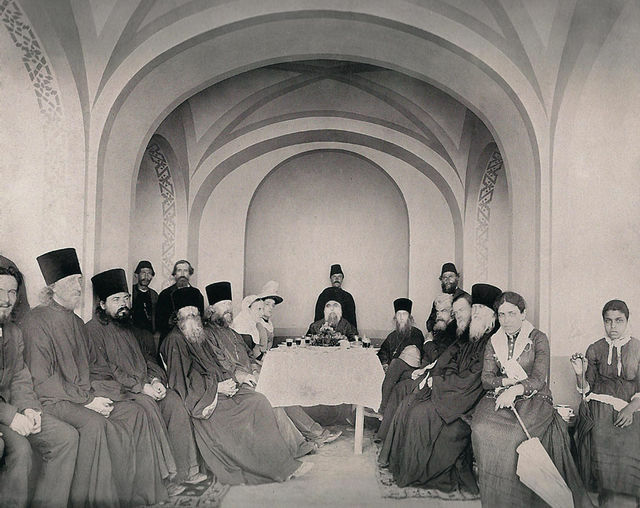 A little more than a year after the consecration of the church of St. On December 6, 1889, the Grand Duke Sergiy Alexandrovich, Chairman of the Imperial Orthodox Palestine Society, Mary Magdalene, and by 1889 the Society received the honorary title "Imperial" for its ascetic activities, took care of allocating the annual funds of the Church of St. Mary Magdalene in Gethsemane, which asks in his Rescript of the Minister of Foreign Affairs N.K. 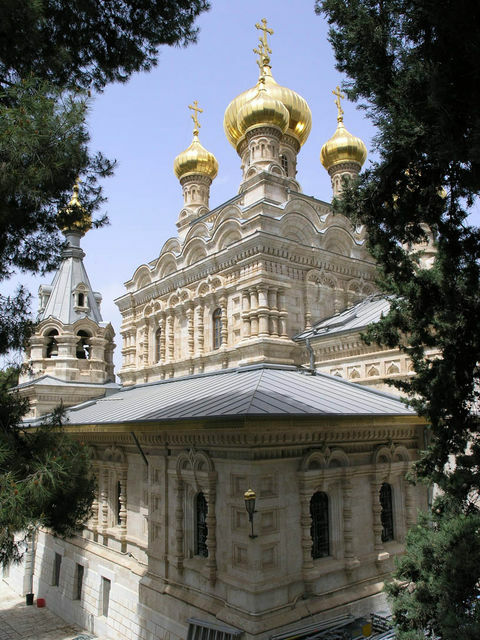 Girsa: "His Imperial Majesty will be pleased to order to release annually five thousand rubles in gold, calculated for the repair and maintenance of the parish church of St. Mary Magdalene on the Mount of Olives in Jerusalem ..." . 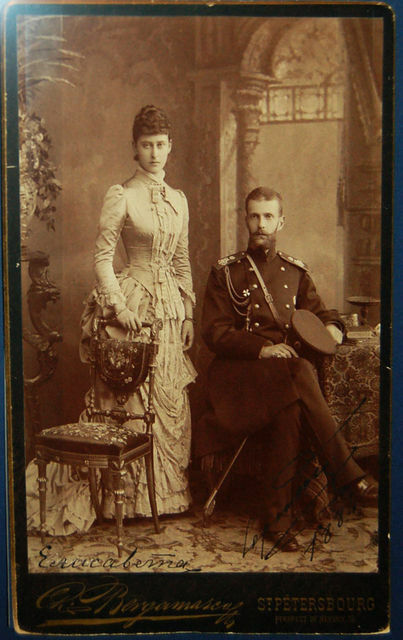 Grand Duke Sergiy Alexandrovich - Chairman of the IOPS and his wife Grand Duchess Elizabeth Feodorovna. Publication on July 2, 2011. All rights reserved. Russia in the Holy Land. Documents and materials. Archive of foreign policy of the Russian Empire of the Ministry of Foreign Affairs of the Russian Federation. M. 2000. T 1. No. 175. Rescript of the Chairman of the PPO Grand Duke Sergei Alexandrovich in the name of the Ober-Procurator of the Holy Synod KP Pobedonostsev. Without the date of 1888 (WUA RI, RIPPO, op 873/1, d. 292, sheet 15-22 vol.) P. 451. Russia in the Holy Land. Documents and materials. Archive of foreign policy of the Russian Empire of the Ministry of Foreign Affairs of the Russian Federation. M. 2000. T 1. No. 38. Journey to the Holy Land of the Grand Dukes of Sergei and Pavel Alexandrovich and Grand Duchess Elizabeth Feodorovna. September 29-October 6, 1888 (WUA RI, RIPPO, op 873/1, d. 293, l 47-48 ob.) P. 162-166. L. Miller. Holy Martyr Russian Grand Duchess Elizabeth Feodorovna. Publishing house "Pilomnik". Moscow. 2006. p. 59. Russia in the Holy Land. Documents and materials. Archive of foreign policy of the Russian Empire of the Ministry of Foreign Affairs of the Russian Federation. M. 2000. T 1. No. 177. Rescript of the Chairman of the IOPS of the Grand Duke Sergei Alexandrovich to the Minister of Foreign Affairs N.K. Girsa. December 6, 1889 (WUA RI, RIPPO, op. 873/1, d. 494, sheet 16). Стр. 459.